Matchday 18 proved to be one of the most unpredictable Official Fantasy Bundesliga weekends of the season, so if you managed to hit triple-digits, bravo! Tweak your Official Fantasy Bundesliga team here! Sandro Wagner saw red in Leipzig, Yuya Osako had the game of his life against SV Darmstadt 98 and Robert Lewandowski and Pierre-Emerick Aubameyang both failed to get on the score sheet. Hopefully this weekend will be a little more straightforward and I’ve got my eye on three fixtures, spread across all three days, that could provide dividends. Hamburg have looked off the pace at the start of the New Year having suffered back-to-back losses to VfL Wolfsburg and FC Ingolstadt 04 and, with the worst-home record in the division, now face the unenviable task of hosting Bayer 04 Leverkusen. 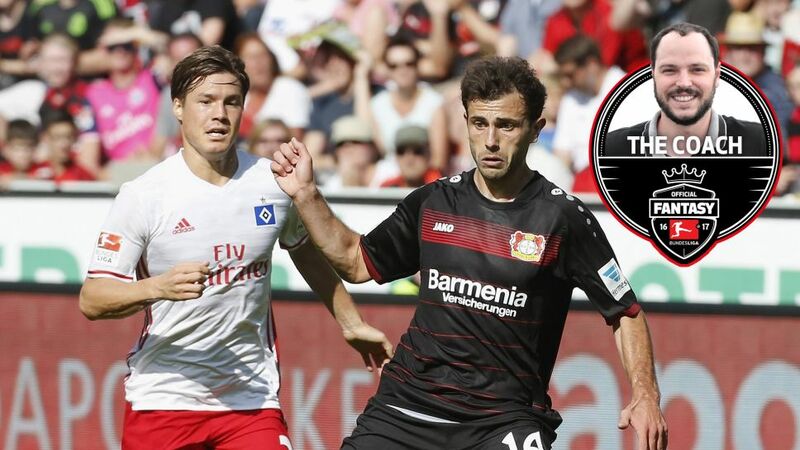 Die Werkself will also be highly motivated to right the wrongs from last weekend – when they let a two-goal lead slip in their 3-2 defeat to Borussia Mönchengladbach - and I reckon their pace in the final third will cause HSV big problems. Wendell (DF, 115pts, 12.5M): Wendell’s overlapping will test the HSV defence, while his average of 11 challenges won a game could be complimented by a clean sheet bonus. Stefan Kießling (FW, 29pts, 12.45M): With Chicharito out injured and Hakan Calhanoglu suspended, Stefan Kießling offers an interesting alternative. After all he did score 15 points the last time he featured in the starting line-up. Gladbach are still unbeaten under new head coach Dieter Hecking following their stunning come-from-behind win in Leverkusen, but if we can take anything from Freiburg’s first two games of 2017 it’s that they are no pushovers. Christian Streich’s side are just four points off the top six, but have struggled away from home, picking up eight points from a possible 27. Gladbach won’t have it easy, but I’m backing them to avenge their Matchday 2 loss. Mahmoud Dahoud (MF, 76pts, 11.8M): Christoph Kramer is a safer option for solid returns, but Dahoud is cheaper, loves to get forward and has more potential for a big points haul. Lars Stindl (FW, 113pts, 13.95M): Stindl single-handedly led the Foals revival, but beyond his goalscoring exploits, the Gladbach captain averages over ten challenges won a game. Boasting the third-best defensive record in the division, Frankfurt’s incredible upswing under head coach Niko Kovac shows no sign of slowing down following their defeat of FC Schalke 04 last time out. Darmstadt, meanwhile, were rocked after being hit for six by Köln and, considering how poorly they defended in wide positions against the Billy Goats, are likely to struggle against the Eagles’, who thrive on getting chalk on their heels. Bastian Oczipka (DF, 142pts, 8.85M): Frankfurt’s backline offers plenty of low-budget options this weekend, but Oczipka has the edge with set-piece duties in his locker. Alexander Meier (FW, 89pts, 12.45M): Meier was sensational in the win over Schalke, scoring the winner and winning 15 challenges in the process. More of the same please! I’ll be honest, the biggest conundrum I’m facing this weekend is who to replace Sandro Wagner with for the next two games. In my mind I’ve got four options - two feature in my recommendations, while the other two will remain a secret for now. I’ll let you know on Friday who I choose!